Tension is mounting at the Chinese manmade island of Mischief Reef in the South China Sea as two U.S. guided-missile destroyers sailed near the area considered to have stirred several territorial conflicts in the region. Last year, China added surface-to-air missiles to the contested island, one of three that the Chinese military fortified in 2018. The destroyers conducted the passage, illustrating the continuing U.S. military presence in the area, to which China routinely has objected. Cmdr. Clay Doss, U.S. 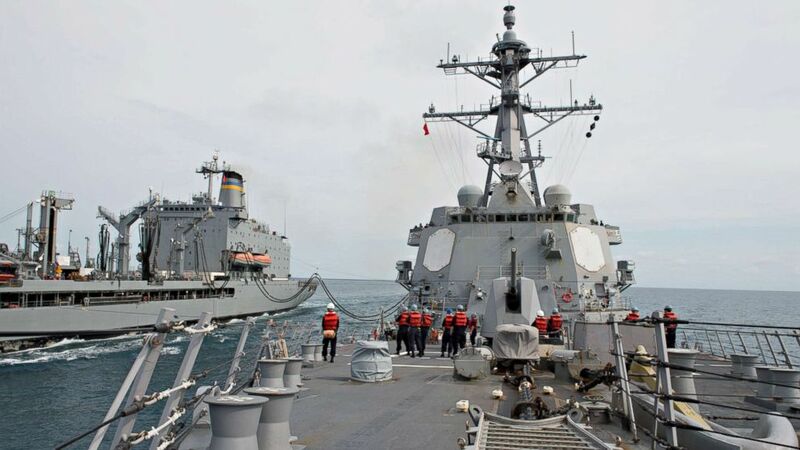 Seventh Fleet public affairs officer, told Fox News in a statement: “Guided-missile destroyers USS Spruance (DDG 111) and USS Preble (DDG 88) conducted freedom of navigation operations (FONOPS) in the South China Sea. The warships were shadowed by Chinese assets, but the interactions were routine and uneventful, according to a separate U.S. official. China is pitted against smaller neighbors in multiple disputes in the South China Sea over islands, coral reefs and lagoons in waters crucial for global commerce and rich in fish and potential oil and gas reserves. The operation came as the Trump administration has prepared for another round of trade talks with the Chinese government. Treasury Secretary Stephen Mnuchin is leading a delegation set to meet with Chinese officials on Thursday and Friday. The talks are aimed at resolving a trade war that threatens to stunt global economic growth, in part by raising prices on goods for consumers and companies, officials said. The situation could get worse as a truce on tariffs is set to expire in early March.